As a tribute to the aesthetic and technical breakthrough embodied by the Masterpiece Roue Carrée model, the two biggest Swiss watchmaking museums have each added one of these timepieces to their collections. On Thursday 6 June 2013, Maurice Lacroix generously donated one watch to the International Museum of Horology in La Chaux-de-Fonds, and one to the Museum of Horology in Le Locle. A paradox was born! “By creating the Masterpiece Roue Carrée model, Maurice Lacroix has changed the face of watchmaking and pushed back the boundaries of possibility”, outlines Managing Director Marc Gläser. Indeed, with its system of gears featuring a square wheel turning on itself, Maurice Lacroix has succeeded in combining aesthetic research, emotion and cutting-edge technology, together in one watch. 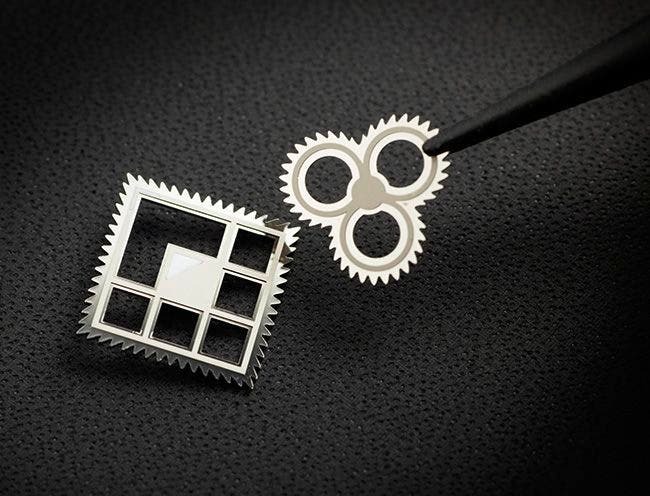 Since a square wheel by definition has irregular gear profiles, the watch brand developed a precisely shaped set of gear teeth to ensure constant transmission of energy, thus giving life to the fascinating spectacle that unfolds on the dial. It was the start of a new era.